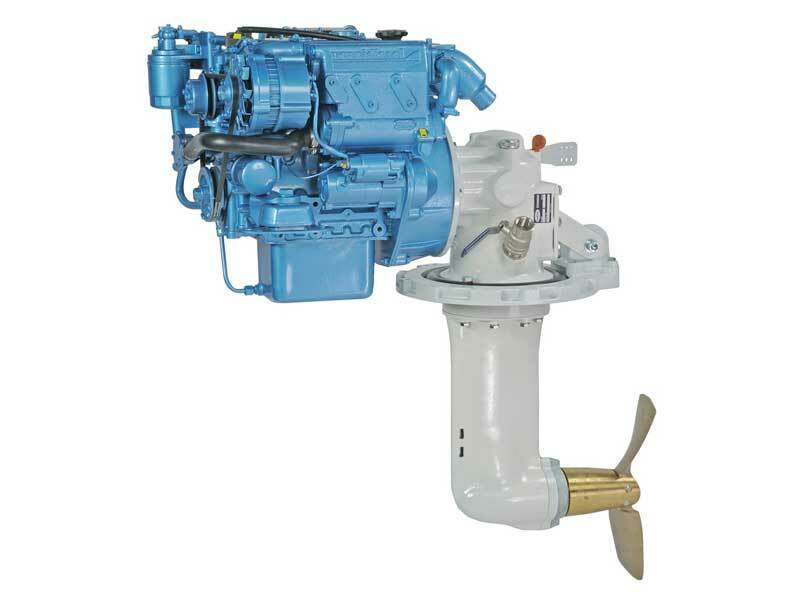 The N3.21 Nanni marine diesel engine is a fine example of what a difference a third cylinder can make over twin-cylinder engines, without seriously adding bulk or weight to an installation. Testing showed the Nanni N3.21 marine diesel engine had an almost flat torque curve, a characteristic of excellent engine design. While recently testing Cummins QSB 5.9 marine diesels in a Caribbean 35 owned by my mate Chris, I also had the opportunity to try the 7kVa Onan genset fitted. Straight up the genset was way too smooth running to have a single-cylinder engine. So Chris checked the genset specs and found it was powered by a three-cylinder Kubota diesel, the same as used by Nanni Diesel in its N3.21 yacht auxiliary engine. Although this reaches 3600rpm, the Onan has fixed rpm of only 1500. It’s a weird way to review a yacht marine diesel engine but it was so smooth at 1500rpm, even with the air-con sucking a fair bit of juice, and would only vibrate less as the rpm increased. And with absolutely no oil or grey smoke on cold starting. Like all current indirect injection Kubota diesel engines, the Nanni Diesel N3.21 has a Tri-Vortex Combustion system designed to completely burn all the fuel in the pre-combustion chamber. Combined with the heat exchanger cooling system that maintains reasonably constant coolant temperatures, this enables the engine to meet all current European and US recreation engine emissions standards. Of course the engine has traditional Kubota industrial/tractor features, such as cast iron cylinder head and block and a gear-driven camshaft operating push rods to actuate overhead valve rockers. Simple and reliable. Nanni Diesel really cares about its customers and saving face with passengers aboard, so no hand starting is fitted. Just as well as without decompression levers the 23:1 compression ratio is a bit steep to overcome manually. The standard voltage regulated 70amp/h alternator and the A4 instrument panel provides adequate engine operating info, such as a tachometer with digital hour meter and key-switch glow plug and ignition. There are warning lights for glow plug over-use, coolant overheat, low oil pressure, battery charge failure and water in the fuel sedimenter. Measuring 205 x 120mm the compact panel won’t encroach much on the limited cockpit space of a small cruising yacht. All regular service components are at the forward end of the engine, with a gear-driven saltwater cooling pump and belt-driven freshwater pump. The V-belt that also drives the alternator is exposed, as Nanni Diesel logically reasons why would anyone be stupid enough to stick their fingers into a rapidly moving belt? Nanni Diesel doesn’t list the right sump oil grade but I suggest using a good quality SAE 15W40 oil rated for diesels and changing the oil and filter every 100 running hours or annually – or every six months if you mainly manoeuvre a yacht in and out of a marina. The filter is located at the forward end of the engine to port and directly below the high-mounted alternator and being on its side, won’t dribble oil down the block when changed. The deep sump holds a reasonable three litres but the evacuation pipe is at the forward end. Fine if the engine is mounted parallel to the waterline when driving a saildrive but a bit hard to completely remove old oil when the engine is inclined in a shaftdrive installation. Two gearboxes and a saildrive are available but frankly the Technodrive SP60 saildrive is a bit of overkill for an engine of this output. With the standard straight-output TMC40 box the N3.21 is 659.5mm long, 472.5mm wide and 505.7mm high. Including the fibreglass mounting base the saildrive model is 945mm long and 678mm high with the width being the same as the shaftdrive model which has a gear reduction ratio of 2.38:1 as the prop speed of any cruising yacht or displacement cruiser should not exceed 1600rpm. Any faster and there’s a risk of cavitation occurring from air bubbles created by obstructions ahead of the prop. In my opinion Nanni Diesel has done well to use Kubota-base engines for its smaller yacht auxiliary and displacement cruiser diesels. The N3.21 is a fine example of just what a difference a third cylinder can make over twin-cylinder engines without seriously adding bulk or weight to an installation. For example, despite developing 50 per cent more power and 57 per cent more torque than its twin-cylinder N2.14 counterpart at the same rpm, the N3.21 is only 15 per cent heavier with the standard TMC40 shaftdrive gearbox. There’s a helluva lot more power and torque for such a little increase in weight and the overall length is only 67mm or 11 per cent more. And judging from the way the engine performed in the Onan genset, if you’re a porker like me your flab will remain intact, great for testing the stability of boats when you go aboard. Nanni Diesel has servicing agents around the country, so owners should never be too far from spares or technical advice. For more information on the Nanni Diesel N3.21, visit nannidiesel.com.au. * Min and max continuous cruising rpm. Like all mechanically-injected diesels the N3.21 may glaze its cylinder bores through fuel over-supply below 2400rpm. Running the engine continuously at 400rpm below maximum will maintain load but not overstress the engine. However I recommend reducing to 3000rpm in large head-seas to prevent engine overload. Note the almost flat torque curve indicative of good engine design. Sea-trial data supplied by the author.